Golden Langurs which has long been considered sacred by the Himalayan people was first discovered by the great Naturalist E. P. Gee in the year 1955 as a new langur of golden colour from Assam-Bhutan border area of Goalpara District of Assam in India. Golden Langur is an Old World monkey found in small region of Western Assam in India and in the neighbouring foothills of the Black Mountains of Bhutan. It is also called as ‘Gee’s Golden Langur’ and ‘Golden Leaf Monkey’. Of the known 15 species of primates from India, 9 species are found in the state of Assam and the Golden Langur is one of them. The scientific name of Golden Langur is Trachypithecus geei which belongs to Cercopithecidae family of primates. 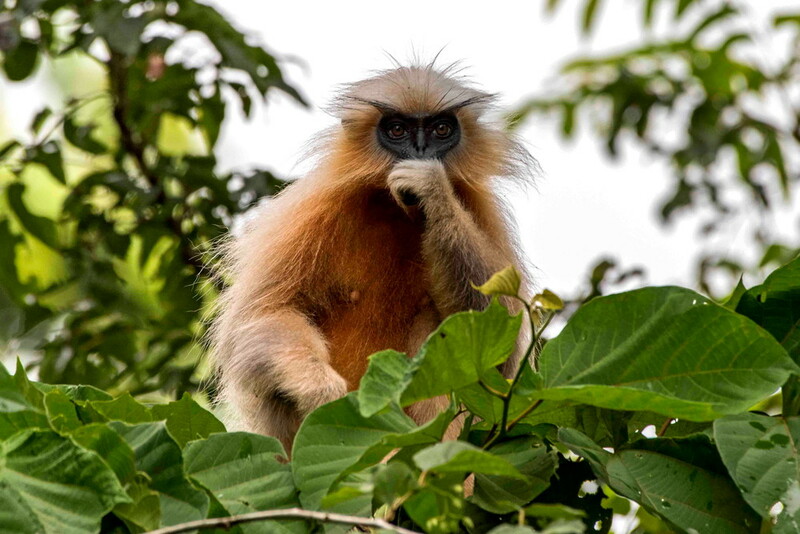 Golden Langurs which has long been considered sacred by the Himalayan people was first discovered by the great Naturalist E. P. Gee in the year 1955 as a new langur of golden colour from Assam-Bhutan border area of Goalpara District of Assam in India. Thereafter Dr. H. Khajuria, a scientist from Zoological Survey of India described it as a new species of langur by giving its detailed morphological description. Golden Langur has two subspecies. One is Trachypithecus geei geei and other is Trachypithecus geei bhutanensis. The latter has been reported from Bhutan in north of its range while former occurs in the south of its range. Because of a serious population decline, Golden Langur is listed as ‘Endangered’ in the Red List of Threatened Species of International Union for Conservation of Nature and Natural Resources (IUCN). Endangered species are those species which are in danger of extinction and whose survival is unlikely if the causal factors continue to be operating. Their numbers have been reduced to a critical level or whose habitats have been so drastically reduced that they are deemed to be in immediate danger of extinction. Golden Langur has a narrow distribution range. It is found only in North-eastern India and Bhutan. This primate species is confined to a forest belt in western Assam between the Manas River in east, Sankosh in the west and Brahmaputra in the south along the Indo-Bhutan border. The distribution of Golden Langur in Bhutan is limited to the foothills of the Black mountains. The total range of this primate species in both India and Bhutan is less than 30,000 km2. The coat of adult Golden Langur ranges from creamy white to golden colour, gaining a more reddish tinge in winter season. On their flanks and chest the hairs are darker and often rust coloured. The body coat of new born infants varies from creamy white to pale in colour which gradually turns into golden colour. The skin colour is black throughout the life in both sexes. The Golden Langur has a black face. The overall shape of this primate species is slim, with long limbs and tail. The tail has a tassel on the end and is notably larger in males than in females. Males are slightly larger than females. The head and body measures from 50 to 75 cm and the tail ranges from 70 to 100 cm. The weight of the Golden Langur ranges from 9.5 to 12 kg. Golden Langurs are shy species that avoids humans. They inhabit in mixed deciduous to semi-deciduous moist Sal forest with some riverine and savanna forest. This species experiences a considerable range in elevation of near sea level in south to above 3,000 m. in north. One isolated population is found in the Abhaya Rubber Plantation, Nayakgaon in Korkrajhar District of Assam. Golden Langur generally occupy middle to high canopy of the forest during foraging. Occasionally they are seen on the ground when there is scarcity of food. They maintain a home range and explore the area for food and shelter. During the hot sunny days they rest under the thick foliage of the trees while during winter season they generally take sunny bath on top branches of the trees. Golden Langurs are diurnal hence their activities are confined to light hours between dawn to dusk. Golden Langur generally lives in troops of about eight individuals but sometimes up to 50 individuals with several females to each adult male. The smallest Golden Langur troop is composed of four individuals while the largest has 22 individuals. The adult gender ratio is 2.3 females to every male though the majority of groups have only one adult male. Golden Langurs are vegetarian in nature. Their diet consist of ripe and unripe fruits, young and mature leaves, leaf buds, flower buds, seeds, twigs and flowers. Although they eat a variety of food, they mostly prefer to eat young leaves. The main food tree species of Golden Langur include Terminalia bellerica, Terminalia crenulata, Cedrela toona, Bombax ceiba, Amoora wallichi, Albizia lebbeck, Gmelina arborea, Dalbergia sissoo, Lannea grandis, Salmalia malbarica and Ficus benjamina. Golden Langur breeds during winter and summer months. The infants are born in months of May and June in summer season and November to January in winter season. Single infant is born at a time. There is an estimated population of less than 1,500 individuals in India and around 4,000 individuals in Bhutan with less than 2,500 mature individuals globally. The population has declined by more than 30% in last 30 years and expected to decline further in near future. Habitat loss due to deforestation has been the main threat to the survival of Golden Langur. Due to habitat loss the population of this species has been restricted to fragmented forest pockets especially in India. A comparative analysis based on satellite images taken in 1988 and 1998 showed a 50% loss of original habitat in India for this species. Electrocution from power lines and hunting by dogs are local threats affecting the population of Golden Langur. High juvenile mortality, inbreeding and local trade in live animals as pets and in road shows are the other threats to the survival of Golden Langur. Golden Langur is a Schedule I species in the Indian Wildlife Protection Act (1972). This primate species has also been listed on Appendix I in Convention on International Trade in Endangered Species (CITES). The Chakrashila Wildlife Sanctuary and Manas Wildlife Sanctuary in Assam are the two protected habitats for this species in India. The following actions are needed for the conservation of Golden Langur in India. 1. To check the habitat loss of the species. 2. To regularly monitor the population of Golden Langur. 3. To rebuild the lost habitats of Golden Langur with the help of local residents. 4. To insulate or divert the electric lines passing through the habitats of Golden Langur. 5. To motivate villagers to restrain their dogs. 6. To strictly enforce the Indian Wildlife Protection Act. Conclusively it can be said that Golden Langur is a species of primate confined to a small pocket of north-east India and Bhutan is facing threat of extinction chiefly due to habitat loss. Therefore it is utmost need to conserve this species of monkey for the maintenance of biological diversity and ecological stability.